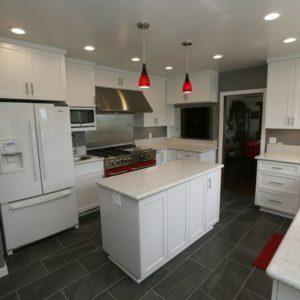 Depending on the scope of your project,Kitchen remodeling in Irvine CA has the potential to involve many challenging tasks, from installing perfectly level countertops and cabinets to rerouting plumbing and gas lines. Naturally, you need an experienced contractor like Cabinet Magic to make your project a success. Cabinet Magic is a licensed contractor with the skills and experience required to guide remodeling projects of any size or complexity to completion. We seriously care about client satisfaction and we will work hard to make sure you love your new kitchen. Kitchen remodeling in Irvine CA can range from simply updating the room with new cabinets, fixtures, and accessories to totally redesigning the floor plan. In either case, you may be concerned about how the finished project will turn out. After all, samples can look quite different in your hand than installed in your kitchen. At Cabinet Magic, we believe being able to accurately visualize your kitchen remodeling in Irvine CA before work begins is key to being satisfied with the final result. That’s why we use computer rendering software to create detailed 3D images showing what the finished remodel will look like. By giving clients a “preview” of the finished job, we offer an opportunity to make any necessary design changes before work begins. Are you ready to stop dreaming of kitchen remodeling in Irvine CA and start actually making it happen? Call Cabinet Magic at 800-828-4380 now and request your free in home consultation. You’ll have an opportunity to bounce design ideas off of us and then receive a free estimate for your remodel.